440magnum Mopar Enthusiast Network – Dodge, Chrysler, Plymouth, Jeep And Other Mopar Information. 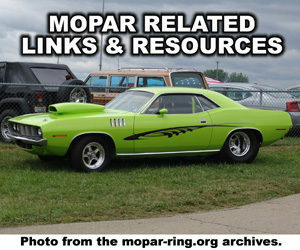 Thousands of featured Mopars, Downloads, Pictures, Free Mopar Only Classifieds and more. The Mopar Ring site is hosted on a server space donated by The 440magnum Mopar Enthusiast Network. Mopar Parts – Official site with sportswear, parts, accessories, service, maintenance, and the much talked about crate motor. Chrysler, Dodge, Jeep, Ram, Fiat Parts. Mopar Search – A unique search engine providing results from the internets best Chrysler, Dodge, Dodge Truck, Plymouth, Jeep and Mopar related sites. Mopar Works -A human edited directory and search engine devoted to all things Mopar related. Top 100 Mopar Sites – The Internets Top 100 Mopar Sites, including AMC, Chrysler, Dodge, Dodge Truck, Jeep, Plymouth and Mopar related sites. Official Chrysler site – The Chrysler site is your source for Chrysler dealers, vehicles, offers, and programs. Research, compare, and shop Chrysler cars, minivans, SUVs, and more. Walter P. Chrysler Museum – History of Chrysler and its ancestor companies and brands. 75 vintage vehicles. History includes current brands, as well as DeSoto, Nash, and AMC. Official Dodge Site – New Autos, Trucks, Minivans, SUVs, Cars, Wagons The Dodge site is your resource for Dodge news, vehicle information, offers, Dodge dealers, vehicle quotes and more. Official Jeep Site – 4×4 SUV, Sport Utility Vehicle. The Jeep SUV site is your resource for Jeep news, SUV information, offers, Jeep dealers, and 4×4 and off-road guides. Ram Trucks – Official site of Ram Trucks, the hardest working trucks in America. Ram pickups, work trucks and commercial vehicles. Automotive Ring – An online community built for Automotive Enthusiasts around the world. Built to promote automotive Clubs, Businesses and Personal web pages. Your invited to join the community, joining the Ring is totally free and is a great way to get more people to visit your Automotive site. HD Automotive Wallpaper – A unique collection of free Car and Truck desktop wallpapers available in popular high definition (HD) and HDTV sizes. Collection includes desktop backgrounds featuring custom cars, classic cars, muscle cars, street rods, trucks, and more. SEMA Action Network is a nationwide partnership of car clubs, and individual enthusiasts (like you) who work together to impact legislation that affects car and truck hobbyists of all kinds. By joining the SAN you will receive up-to-date alerts on hobby-related legislation in your state and across the country. Best of all – it’s free. Top 100 Truck Enthusiast Sites – A collection of truck related resources including Big Rig sites, Classic Truck sites, Club sites, Truck Enthusiast sites, Modern Truck sites, off road and 4×4 sites, Parts and services sites and more.